One genre of games that has achieved unprecedented popularity in the age of casual and mobile gaming are match-3 titles. Bejeweled is the genre’s most successful example, but its roots can be traced back at least as far as 1989’s Columns, which was packaged with Sega’s Game Gear to compete with Nintendo’s Tetris bundle for the Game Boy. With the accessible nature of match-3 games, it’s no wonder they’ve flooded the mobile gaming market — so when a new such title comes around, it’ll have to make a big effort to set itself apart from the pack. Azkend 2: The World Beneath tried to achieve this through its lush presentation of the story of a pirate captain, as her ship is sucked through a vortex into a strange, forested underground world. Part of this unusually opulent presentation (at least for a match-3 game) was a synth-orchestral soundtrack by indie composer Jonathan Geer, who had already gathered experience in the genre with his score for 2009’s Dragon Portals. Due to the more low-key nature of the games he’s worked on, Geer might be less of a household name in the Western indie game score world than lets say Josh Whelchel or Jake Kaufman, but his album output has been consistently strong. 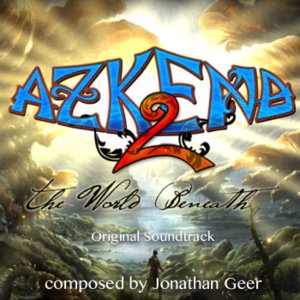 Together with the simultaneously release Neptune Gasoline, Azkend 2 was Geer’s most ambitious soundtrack yet and released through his Bandcamp site. If you walked into this soundtrack not knowing what kind of game it was written for, chances are that you’d never guess this music for created for a puzzler. Western indie game scores rarely, if at all, venture into purely orchestral territory, but this is exactly what Geer does here, and what’s even better, he pulls this move off effortlessly. This is the kind of full-blown orchestral score that you’d expect to hear in an big-budget RPG. The only element that gives away the soundtrack’s indie roots are some sound issues. The samples sound realistic enough to be convincing, but the intricately layered orchestral textures tend to blur on several occasions and would definitely benefit from a crisper sound. But that’s a small price to pay for the rewarding music that Azkend 2 offers. Azkend 2 reveals its ambitions right from the start when opening track “Azkend 2 Theme” starts with a proud brass melody, filled to the brink with a swaggering sense of high adventure. The brass melody — the game’s main theme — is passed on to the strings before the track segues into a quiet flute solo, followed by a beautifully flowing cello melody. It’s obvious early on that Geer has a firm grasp on how to write a colourful composition that makes full use of the orchestra’s resources, and how to develop that composition by fluently changing its textures and melodic direction. In fact, few other 2012 Western game score releases so far exceed the depth of the title’s orchestral writing. Finally, after some choir-aided march bombast, “Azkend 2 Theme” ends with a sumptuous rendition of the main theme on full strings. Indeed, if you’re a fan of unabashedly sweeping melodies, Azkend 2 delivers all the way during its all-too-brief twenty minutes. Every single one of the score’s five longer tracks features at least one gushing melodic outburst that is a pleasure to behold. On “Discovery” and “Awe”, these moments come courtesy of the main theme, which doesn’t grow old even during these relatively straightforward reprises, as it maintains its indomitable, rousing spirit. Given the theme’s attractive nature and Geer’s obvious compositional skills, it would have been great to see the theme implemented in more varied shapes and more repeatedly throughout the album. But then again, this is the soundtrack for a puzzle game, so the fact that there is a recurring theme running through Azkend 2 is already a pleasant surprise. And it’s not like the main theme is Geer’s only striking melodic creation. “Explorers” and “Rain and Mystery” are based on new melodies which are impressively developed throughout the cues’ running time and crescendo into broad statements that are just as splendid as the main theme’s renditions. Throughout the whole album, Geer showcases his talents at writing strong melodies that range from luscious to intimate and easily hold the multi-faceted pieces together. That’s another one of Azkend 2‘s strengths: instead of throwing a barrage of densely orchestrated compositions at listeners, Geer knows how to pace his pieces and shape their dynamics and flow. This not only allows the ‘bigger’ moments of melodic outpouring to truly shine, but it also lets the music paint a more nuanced picture of Azkend 2‘s underground world by incorporating calmer passages. “Explorers” opens with calm glockenspiel and harp against string tremoli to set a mood of mystery, while later on, gently driving violin ostinati and angelic female choirs manage to combine the soundtrack’s sense of scale with a quiet sense of wonder. This balance comes to mark this title as a whole and makes it the well-rounded, satisfying score that it is — this music is not just about celebrating the discovery of a new world, but also about the careful exploration of its wonders. More examples of this balance of moods abound on other tracks. “Explorers” features some playful violin rhythms and a Harry Potter-esque rising arpeggio figure for harp, flute and violins, which adds a touch of light-hearted magic to the music. At the same time, the composition’s bouncy string rhythms seamlessly turn surprisingly robust once the piece starts building towards its climax. Similarly, “Rain and Mystery” convincingly balances its expansive, slightly Gothic string melody with a delightful passage for harp, piano and glockenspiel. The composition also continues the album’s streak of whimsical wonder when its opening follows tinkling piano and high-pitched violin chords with string pizzicati and the cue’s main melody in a carefree piano rendition. The only composition that falls short of the album’s high standards is “Awe”, which relies a bit too much on its strident string ostinato rhythms. Obviously modelled around these rhythms, the composition does make sure to add an adequate amount of ornamental orchestrations — a falling and rising cello legato line, woodwind flutters, more harp and glockenspiel whimsy — but that’s not quite enough to elevate “Awe” to the same lofty heights as the soundtrack’s other compositions. Then again, that fact that a solid composition like “Awe” turns out to be Azkend 2‘s least impressive inclusion shows how strong this score is in general. Transcending its roots as a puzzler score, Azkend 2 is as sweepingly melodic and richly orchestrated as many top-tier RPG soundtracks. Geer’s first foray into large-scale orchestral music is an impressive success and shows his ability to write luscious, excellently developed pieces that seamlessly switch between moments of wonder, playfulness and grandeur. Geer’s melodic writing is remarkable throughout the album, be it on the cues that feature the main theme, a rousing call to adventure, or on those pieces that are artfully built around melodies that are just as strong as the main theme. The album’s short running time ends up being a point of frustration, but only because it’s impossible not to wonder what Geer might be able conjure if he was allowed to apply his talents to bigger projects than indie puzzle games. At $3 on Bandcamp, this is an easy recommendation.